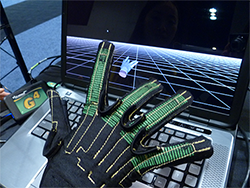 Hand and finger tracking is used in a wide variety of applications. Whether you need to track fingers for a VR application, biomechanics, research, or training and simulation, Polhemus tracking systems offer flexibility and easy set up. Our finger tracking sensors deliver full 6DOF, measuring both position and orientation of both the hands and fingers. Do you need to track one finger, two fingers, or all ten? Our system is set up to accomodate various needs and allows you to scale up, and add sensors, as needed. No line-of-sight requirements means no data gets "lost." No cameras are used, so hands and fingers are tracked even when the system can't see you. Because line-of-sight is not required, users have no data interruption, and our robust systems deliver a steady stream of continuous position and orientation data. Whether you need a wireless option to move around freely in a large space, or you need hand and finger tracking in a more confined area, we have a variety of tracking systems that are compatible with our sensors. Low latency with zero lag time. Our tiny, lightweight sensors attach easily with an inexpensive Micro Mount kit. Custom Micro Mounts adhere firmly to skin and the sensors slide easily in and out of the mounts. Mounts are easily removed and resuable. Wondering how we can seamlessly track hands and fingers without the use of cameras? We use proprietary AC electromagnetics and we've been perfecting the technology for over 40 years. FastSCAN was used in the Joint Mongolian-Smithsonian Deer Stone Project which included archaeological studies of "deer stones" and the ritual contexts in which they are found.